We normally cover about a 50 mile radius of Leamington Spa but there is no reason why, and we often do, carry out work all over the UK. Type of work covered:- Exhibitions, fault finding and repairs, additional lighting and power points, rewires, security systems, heating systems, hot Water systems, showers of all types, higher risk installations such as garages & pools, new houses and extensions, fire alarms and emergency lighting. We operate closely with Insurance Companies, Local Councils and Letting Agencies carrying out Annual / periodic inspection, testing, report writing and upgrade work. All our work is tested on completion and a N.I.C.E.I.C. certificate issued for the installation work. 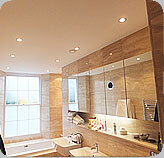 You are covered by our 10 year workmanship and the manufacturers guarantee (normally a minimum of 12 months).